Finding chocolate fudge on eBay or Amazon is a sweet surprise for those of us who love to sink our teeth into a tasty bit of fudge on a regular basis. Perhaps you might be someone who loves to sink their teeth into a tasty auction instead. :) Either way, eBay is a great consideration. You can get some really scrumptious homemade chocolate fudge in a lot of different varieties. What I really like about buying fudge on eBay is that the prices are very competitive. You can usually purchase a pound or two of homemade fudge for a lot less than what you'd pay at a local sweet shop. Amazon is also a great online buying option when it comes to fudge. Because they have vendor's from all over, you get a terrific selection without having to visit a dozen different websites. I've started by listing a few of my favorite selections from Amazon and then followed that with some of today's fudge listings on eBay. If you don't see exactly what you want on this page, just click on over to their website and use their search feature to be more specific, for example "gourmet chocolate peanut butter fudge." Enjoy! Buying fudge at local shops can be pretty expensive. I've paid $4-$5 just for one piece that wasn't even as big as the palm of my hand. Really, though, the reason I mention this is because when you consider the cost of buying all the ingredients and making the fudge yourself you can make fudge usually a lot cheaper than you can buy it. I love fudge, particularly around the Christmas holidays, and it's not that hard to make. If you want to give it a try, test out one of our chocolate fudge recipes. Having said that, sometimes you want to order a gift for someone or you just can't be bothered to go to the trouble to make your own fudge. In that case, the best prices for fudge can often be found on eBay. They have vendors selling more than just chocolate fudge, too. I've bought, peanut butter fudge, maple fudge, etc. All you have to do is go to eBay and then type in exactly what you want in their search feature and you'll get all the latest results. If I win this particular auction, my fudge will end up being cheaper than if I made it myself. How can I go wrong? No! I'm not telling you which auction because I don't want more competition. 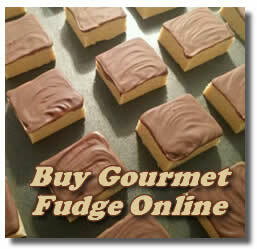 Find your own fudge on eBay!